Michelle Slade, personal finance analyst at Moneyfacts.co.uk – the money search engine, comments: “With PPI currently under the OFT microscope and being seen as an ‘overpriced, inflexible’ product, you may have thought lenders would be reluctant to rock the boat further. However as the moneyfacts.co.uk survey shows, for many providers the price has continued to climb over the last year. 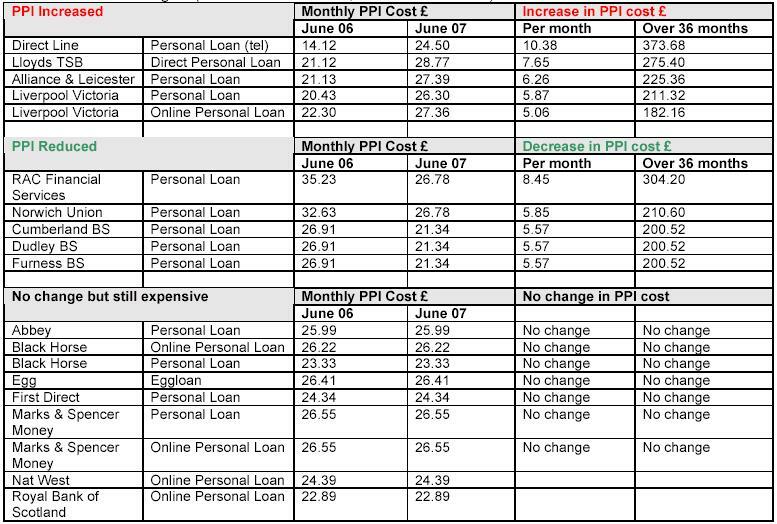 “Although the average cost of personal loan PPI has not changed, there have been some hefty changes in premiums from a number of providers. “The cheapest cover for a £5k loan over 36 months still remains around £14, and the most expensive at £35. This means by choosing a loan with the most expensive PPI could cost you as much as £756 more over the three year term. Not only does the price vary, so does the level and type of cover provided, with differing terms, qualifying periods and conditions included. “Also because your insurance premium will be added to the amount borrowed, the total amount payable can fluctuate further still, depending on the interest rate you are charged. “While it can not be disputed that insurance against, life, accident, illness or unemployment can prove invaluable in some circumstances, the downside is the cost, inflexibility and the sales process associated with loan PPI. The huge profit margins on PPI are illustrated further by the fact that independent providers can offer the same cover at a fraction of the price. “The examples below just show how competitive these deals can be, offering savings of between £500 and £1200 compared to the policies offer by the loan providers. “Don’t feel bullied into taking the loan providers insurance, as this should have no impact on whether your application is accepted. Remember to check out the full terms of any loan agreement you sign: in some cases you may be required to opt out from the insurance rather than opt in. “Any savings made on choosing a competitive insurance policy could be put to better use by repaying your loan earlier. 20 Jun 07, 21:13 Pinacle Insurance - Avoid ! I had payment protection insurance from pinacle, after about 6 months of paying premiums which is about the period that you are now allowed to claim, the wrote to say that the insurance would no longer be continued. So basically I had paid 6 months premiums for nothing, for no cover. If your looking for any type of insurance, I would seriously recommend you stay away from pinacle insurance because of such practices ! Did they give you an acceptable reason for cancelling the Insurance Cover..? If not Im sorry but I would be asking them a lot of questions and reclaiming any premiums that they had taken.